While it’s not made of steel, I felt a pen I recently acquired was interesting enough to add to the blog. It is a gold dip pen (just the nib and collar, the wood or MOP handle is gone) with what looks like the original box. Let’s start with what can be known before we move into speculation. The easy part is that this is a gold pen made/sold by Piquette of Detroit. Charles Piquette was a jeweler who was in business from 1845 until 1860 or so. I know Piquette is no long in the business because by 1861 Charles Dunks was calling himself “successor to C. Piquette” and listing the same Jefferson Ave. address. It seems he took over Piquette’s business. The nib may well have been made by Dunks as there’s some evidence that Dunks was Piquette’s pen maker. This comes from a claim that the pen Abraham Lincoln used to sign the Emancipation Proclamation was made and donated by Dunks right after Lincoln’s election. Lincoln also used it to write his first inaugural address. Piquette made gold pens and ran a re-tipping service ($0.50 for pointed pens, $0.75 for engrossing, i.e. stub or italic, nibs) out of his jewelry store in Detroit. My pen is an oblique nib very similar in design to the 1831 Mordan patent for the first oblique nib. It is well-tipped and in great shape. Those are not cracks, but dried ink. This imprint “Spencerian Pen” is the main puzzle about this pen. During the time when this pen was most likely made, 1845-1860, Platt Rogers Spencer was actively getting his idea for business colleges off the ground, and publishing his first books of penmanship, explaining his methods and style (1848). Most of the Spencerian pens we know of today were made by The Spencerian Steel Pen Co. which was founded by NY publisher and bookseller Ivison Phinney around 1858. 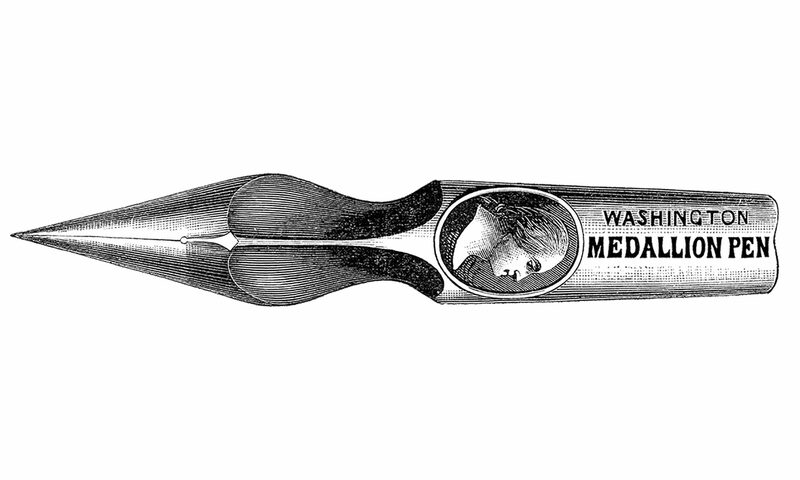 Their pens were made by Josiah Mason, as provided by Perry, until very late in their production. I don’t see this nib as having any relationship to that company at all. The fact that it’s marked “Spencerian Pen“, singular, not “Pens” plural, makes me think this was an imprint to indicate that this pen was good for Spencerian writing, rather than any officially marketed pen. It’s like the later steel pens which were marked as appropriate for Vertical or Modified Slant styles of penmanship, but this one is for Spencerian, the popular style at the time. I don’t know a lot about gold pens, but it is my understanding that oblique gold pens are fairly rare, and Piquette pens are not too common, and then to find on top of those aspects, a pen marked as good for Spencerian penmanship from the time when Platt Rogers Spencer Sr. was still active, makes this a rather special pen after all. I’d love to hear if others have seen anything like this, or have pens from this time, gold or otherwise, marked for Spencerian writing. Interesting thing is that the pen now held by the Massachusetts Historical Society as being the one used to sign the Emancipation Proclamation does not have a gold nib. What is the date on the newspaper article that makes that claim? The claim made by Dunks is from 1863. So, an interesting story. I contacted the Mass. Historical Society and had a nice correspondence with folks there. I saw a picture of the pen they claim is the one which signed the proclamation. What is known is that the pen was given by Lincoln to Senator Sumner, who procured it from Lincoln for the noted abolitionist George Livermore. It was eventually donated it to the Historical Society in 1911 by Col. William Livermore. All we have is Lincoln’s word to the Senator that this is the pen. Now, Lincoln was very impressed by Livermore’s writings, and according to Sumner, they were influential as Lincoln composed the Emancipation Proclamation. Sumner asked Lincoln before it was signed to “take note of the pen used on that occassion and reserve it for his friend [Livermore]” according to the object record in the Historical Society. In Trow’s NYC Directory of 1849, Benjamin is listed as an importer. This is the primary business he was in for at least the next 35+ years. In 1856, he joined with Phineas and they became B. & P. Lawrence. B & P. Lawrence was a stationery and fancy goods importer focusing primarily on Europe. They imported paper products, blank books, and all of the various fancy goods of the time, like inkwells, and valentines and various and sundry. Since Lawrence was a big importer with strong ties to England, and I’ve found no evidence of them ever manufacturing anything, even the blank books that most other big stationers would make themselves, I would be extremely surprised if this was not a British pen branded for the B. & P. Lawrence company. B. & P. Lawrence continued until about 1880 or 1881 when Phineas split off and created P. Lawrence and Lawrence Brothers of London “an export and commission stationery business.” They were “also the sole agent in the United States for Eugene Rimmel’s general line of perfumery and fancy soaps.” (American Stationer, Sept. 8, 1881, p. 238). Benjamin formed B. Lawrence & Co. and continued the import stationery business. They were located at 78 John St. in New York City from 1856 (having moved from 80 John St. when Phineas joined) until sometime between 1875 and 1878 when they moved to 49 Maiden Lane, and then by 1882, after the split, B. Lawrence & Co. moved to 269 Broadway. (1882 Trow’s New York Directory). There are several outstanding questions about this whole pen question. One I have is why Lincoln would be using pens from a single stationery store in NYC when there were Washington DC stationers selling perfectly good pens there in the city. Could he have first used their pens when he was in NYC for the one and only time, when he spoke at the Cooper Union? Did this come from a stash or did he order them directly from the NYC store? Another thought is that if Lincoln really had used a Piquette or Dunks gold pen to sign the proclamation, would he so readily have given away such a valuable object to Senator Sumner? An intriguing possibility is that Lincoln really did use his Detroit-made gold pen to sign the proclamation, but when asked for the pen, gave away a relatively inexpensive steel pen and wooden holder. (Lincoln was known for sometimes displaying his frontier frugality and practicality) What I haven’t been able to track down is if Lincoln had a gold pen from Dunks or Piquette in his possession at his death. If he did, that would lend weight to Dunks’ claim. So, short of finding a record of Lincoln having a gold pen, the weight of evidence is on the Sumner side, and calls into question Dunks’ assertions. But I posit that the jury is still out and the matter not completely settled. Needless to say, I doubt the wonderful folks at the Mass. Historical Society would quite agree. A possible handle for the gold Spencerian pen could have been made of wood, ivory, or mother-of-pearl. The shape could have been merely round and straight. Alternatively, the tail of the handle could have been flared into a flat blade shape for use in opening correspondence. In any case, if this is your pen, you have a fantastic find that is unique in the modern era. Do you plan to clean the ink from it? Thanks, Phil. Yes, it is mine and I do plan on cleaning it up and making a handle from wood. It’s a beautiful writer, too. I’ve never seen another just like it. What I’ve heard from those with much more knowledge of gold pens is that this pen maker made very good quality pens, but there aren’t very many out there. Not surprising considering how long ago he worked. Mother-of-pearl would be unlikely for this holder and this era; ivory, possible; ebonized wood, most probable. Note that the end of the wood taper would usually be fitted with a brass ferrule, so there would be a clean metal-to-metal fit. A blade-shaped taper would not be used in this era and on such a pen.